There are some league matches that just capture the imagination of the general public, for those of my generation who grew up with Italian football shown live on terrestrial television Inter Milan Vs AS Roma is one of those matches. Inter are difficult to fully understand given all of the currents that run through the club and their early season form was nothing short of disastrous. That run of poor form saw the dismissal of the former Ajax coach Frank De Boer with the Dutchman not being given the time to put his own stamp on the squad. He was replaced by the Italian coach Stefano Pioli with the former Lazio man coming in and not only stabilising performances but leading the club to wins as they move up the Serie A table. Whilst the club from the North of Italy have performed well enough of late to bring themselves back in to contention for a European place Roma from the south have emerged once again as the only realistic challengers to Juventus for the Scudetto. With Lucian Spalleti back for his second spell back at the club we have seen Roma play some highly entertaining football as they continue to transition away from the Francesco Totti era. With the Bosnian international striker Eden Dzeko providing the focal point for the team in the attack the movement and interplay from midfield and the wide forwards has been highly impressive. It would be an interesting contrast in styles with Roma travelling to meet Inter at the San Siro, Roma tend to travel relatively well with a good record in away matches this season. With the pace that they possess in the wide areas and the all action style of the Belgian international Radja Nainggolan in the centre they are excellent in quick transitions. Starting with the home side who began with Samir Handanovic in goal. A back three of Medel, Murillo and D’Ambrosio. Antonio Canderva played wide on the right with Ivan Perisic on the left. Recent signing from Atalanta Gagliardini was central alongside Kondogbia. In the advanced central positions Joao Mario and Brozovic played behind Mauro Icardi. Roma on the other hand started with the Polish international goalkeeper Wojciech Szczesny in goal behind Rudiger, Manolas and Fazio. Juan Jesus played on the left and Bruno Peres on the right with De Rossi and Strootman central behind Salah and Nainggolan whilst Dzeko was the lone striker. One of the most interesting tactical aspects of this match was the shape and the structure that Roma adopted whether within the attacking or defensive phases of the match. They prefer to build their attacks through the thirds of the pitch although they do so through quick vertical passes, always looking to play in to advanced areas and create opportunities to penetrate the oppositions defensive structure. Whilst Juan Jesus and Bruno Peres provide width and stretch the opponents defensive block it is the quality on the interior that is the strength of this Roma team. The likes of De Rossi, Strootman and Nainggolan in particular are extremely impressive in building the play. In this image Roma are just starting to transition in to their attacking phase of play. With two Inter players moving up to press the ball as it comes out from the goalkeeper and one other player moving in to cover behind the press we still see Roma play out calmly. The three man defensive line stays relatively compact and De Rossi drops back in to a deep position to create numerical and positional superiority over the Inter players who are looking to press. This creates a diamond shape and allows the man in possession to always have at the very least one clear and easy passing option to allow them to build the play. As one of the more advanced midfielders Radja Nainggolan is free to move across the width of the pitch having been freed of positional responsibility by Spalleti who noted the Belgian internationals ability to press across the width and the depth of the field. As Nainggolan moves out and presses the man in possession Roma are still structurally solid with De Rossi and Strootman dropping deeper to form a double pivot at the base of the midfield to shield the three man defensive line. In the first half the game was relatively even despite Roma taking the initiative with the first goal. Both sides were looking comfortable in possession and Inter were managing to penetrate the midfield block from Roma to move in to advanced central positions with the ball under control. Here Inter are in their attacking phase and with Roma dropping in to a medium block with little pressure being put on the man in possession they have the ability to choose their attacking route carefully. With movement from Joao Mario as he drops off the front line there is an opportunity for the ball to be played in to an advanced central position allowing Inter to turn and attack the Roma defensive line. The lack of pressure on the ball in the first instance allows the ball to be played through the midfield pivot and in to the pocket of space that Inter have created. Once again in this example Inter are looking to attack and are moving down the right hand side of the pitch. This time however the midfield block from Roma is much more compact with no passing lanes open for the man in possession to play through in to the central areas. Instead the ball is played to the man outside and he is quickly closed down by Juan Jesus who moves straight across. 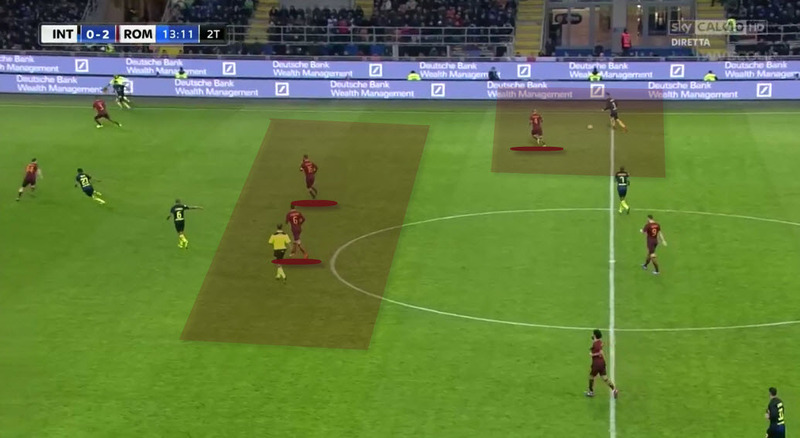 With the three man defence for Roma they are still flexible enough to cover the movement from the Inter players in the half space who may have exploited the space that had been left behind by the movement to close down by Juan Jesus. The biggest difference between the two sides in this match lay in the ability of the visitors to create and exploit space in the final third. This led to a greater number of chances being created and in turn more opportunities to score. The performance and movement of Nainggolan and Salah in particular both of whom drifted in to and out of space across the width of the field was particularly impressive for Roma. One of the most common ways in which Roma build up in their attacking phase is to have the right sided central defender Anthony Rudiger move out with the ball at his feet and look to play penetrating passes through the defensive block of the opposition. Here Rudiger is in possession and under little immediate pressure. He has three short passes open to him should he want to simply shift the focus and the emphasis of the attack. With Dzeko pinning the central defenders back the movement from Salah who looks to move in behind the defensive line would allow Rudiger to move the ball over the defensive line and in to space. That movement in turn creates space for Nainggolan to move in to in the central position. Once again Roma are building their attack through Rudiger who has stepped out from the defence and is looking to play a pass in to the advanced areas. 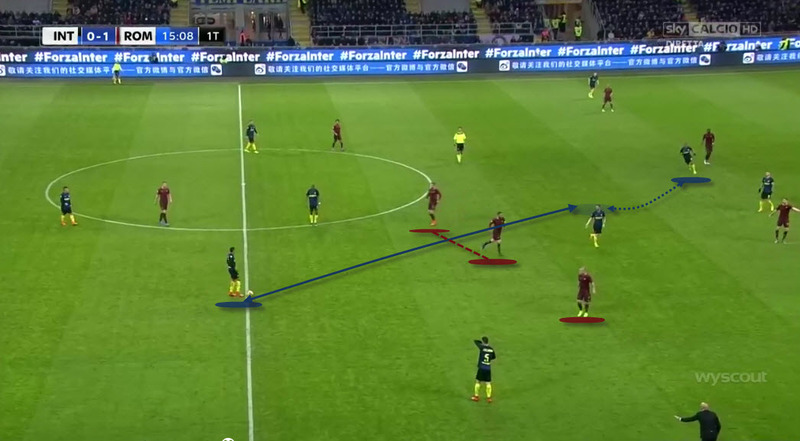 As Radja Nainggolan looks to drop off of the front line in a central area to access a pocket of space it distracts the immediate defensive players. This allows the player in the wide area to shift out and access the wide space. These small pieces of movement are enough to ensure that Rudiger is able to move the ball up the field. Roma were the better side in the match and perhaps this is to be expected given that they have enjoyed more stability on the coaching side in recent seasons. The performance of Radja Nainggolan in particular seemed to make the difference and Inter were unable to cope with his capacity to drive in to central areas with the ball. It remains to be seen whether Inter will stick with Pioli on a permanent basis going in to the new season but empirical evidence certainly suggests that stability leads to success. Will Inter have learnt their lesson in this regard?